Leaving Phoenix, we had two days scheduled to cross Lake Oneida. Looking at the weather, we decided to cross the lake on the second of the two days, and made a short day of it leaving Phoenix and stopping at Brewerton. With an early start the next day, the crew prepared for a long day crossing Lake Oneida. With the moon a sharp crescent and the sun just peeking over the horizon, we exited the river and began the trek across the lake. The morning was crisp, clear, and soon the sky turned into a wash of color from the rising sun. A voyage over the lake was certainly a departure from the routine in the canals, such as it would have been for the 1800‘s canal boatmen. 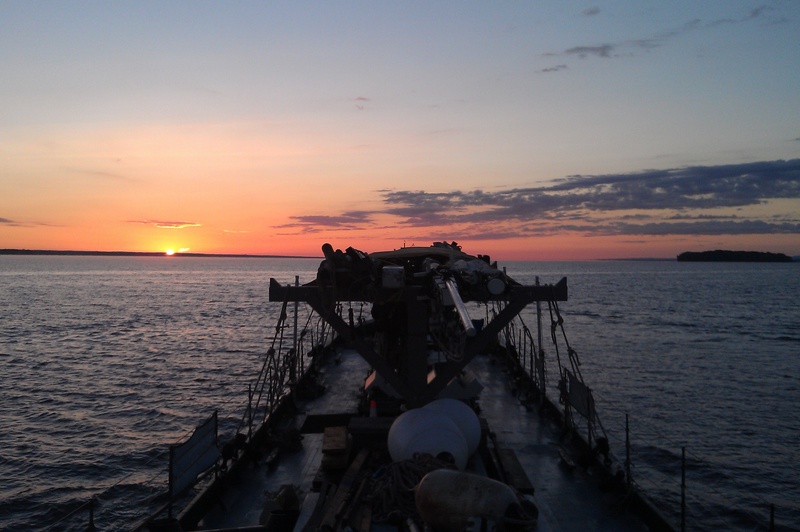 Our crew has experienced rough waters on Lake Oneida in previous years, which prepared them for a rough crossing had the weather strayed from pleasant. Due to its shallow depth, high winds can make Oneida a treacherous body of water, kicking up high waves very quickly. Thankfully the sky stayed fair and the lake was calm, leaving only two locks in our path towards the final ascent to Rome. This point along the canal is pivotal in many ways, marking the highest point along the canal and the divide between watersheds of the Mohawk River and Wood Creek. Rome, N.Y. holds a large deal of historical significance for our tour through the Erie Canal, with many ties to the founding of the nation. In 1758 the British constructed Fort Stanwix, which was used as a strong point along the Mohawk River and Wood Creek. The stronghold would have been vital to supply routes during the Revolutionary War, as well as the War of 1812. In 1813, plans for a United States Armory were developed and the building was constructed in Rome between 1815 and 1816. The complex consisted of several buildings which contained store-houses, a laboratory, stables, mechanics’ shops, offices, officers’ quarters, and the arsenal all surrounded by a large stone wall approximately one story tall. This armory supplied Sackett’s Harbor, which was the main naval base for Lake Ontario. The armory sat on a road between Rome and Sackett’s Harbor, and roughly 300 yards from the soon to be constructed canal system. In 1817 the first ground would be broken for the Erie Canal alongside the Mohawk River in Rome. The canal took roughly 18 years to be constructed, consisting of 18 aqueducts and 83 locks rising 568 feet from Lake Erie to the Hudson River. This introduced the area as, literally, the high point of the early canal, thus inviting industry and commercial trade, which in turn expanded the town of Rome. By 1824 the town had a population of 3569, there were 19 school houses, 3 grist mills, 7 saw mills, 2 oil mills, 3 fulling mills, 2 cotton woolen factories, and 1 stoneware factory. There are many historical attractions, however, one stands out from the others: the Erie Canal Village. Here is a re-creation of a section of canal, lock, and stores that would have been common place in the period. During the right season, the village even has draft horses and mules as part of the old canal exhibit. The horses and mules of the Erie Canal boats were at least as typical as the sails were to Lake Champlain canal boats. Whereas Lake Champlain canal boats were unique in their introduction of sails, the Erie Canal boats instead might have kept a stable in the forecastle for their own team of horses or mules instead. Both methods of propulsion were unique to the area from which a canal boat came. The entire village has a great hands on involvement and is truly a unique experience, transporting you back in time to the way of life in the mid 1800‘s. Along with an excellent reception from the public, Mayor Joseph R. Fusco Jr. visited and toured Lois with interest and enthusiasm. He explained that the infrastructure along the water front had been in a deteriorated state for some time and that he plans on making changes there. Recognizing the importance of the canal with its potential to bring in commerce and provide access for recreational boaters, is vital to the growth and development of this asset to the community. These improvements would also bring forward more opportunity for the public to learn about the historical significance of the town and its role along the canal. This feeling has been reinforced by many of the people involved with the waterfront along the canals. Leaving here we will begin the descent east bound along the Erie towards home, and with each stop colder weather will greet us each morning. The crew is looking forward to returning home after such a long tour, however some of the most interesting towns are still ahead. 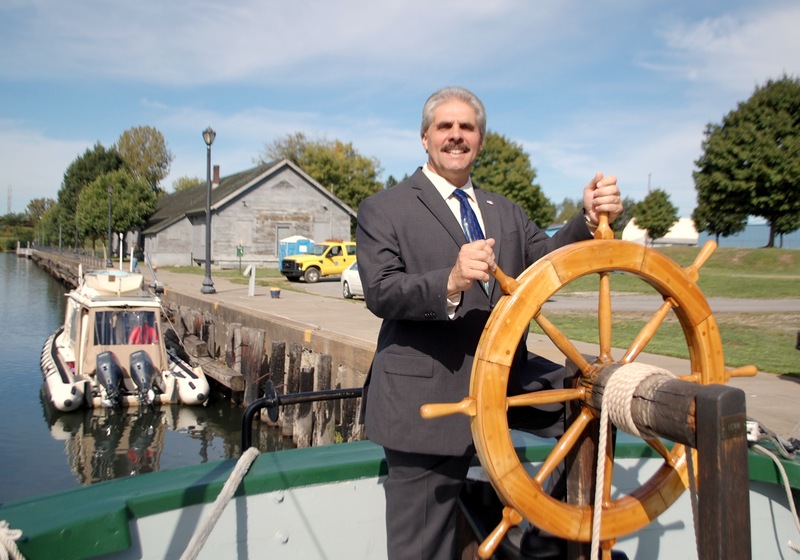 The towns we will be visiting in the next couple of weeks were particularly significant in the early development of the Erie Canal, and we look forward to seeing how these towns have kept their history and the history of the canal alive. A New York native, Ian got involved with wooden boats at a young age – his father runs Cayuga Wooden Boat Works on Cayuga Lake. Having worked as a sailing instructor for Cornell University, Ian joins the Lois for the final leg of her journey through the canal system.